Watermeal is the smallest flowering plant and does not have any roots. 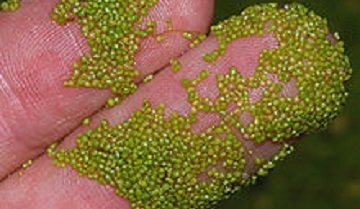 Watermeal is one of the smallest flowering plants on earth. Each plant is either light green or yellow, and about the size of a grain of cornmeal. They will grow in large quantities along the surface of the water in quiet areas of water. This weed multiplies rapidly and can often be found invading ponds with duckweed mixed in. Control of the pond should be sought before it completely covers the pond. If the whole pond is covered, fish could be killed from oxygen depletion. Ducks are known to transfer duckweed from water source to water source. Watermeal can be found all over the United States. We recommend Clipper Herbicide for treatment of watermeal. These products can be purchased on our website.